Prior to 1864, there was no system to the fire alarm. A fire would simply be seen, and then reported via a bell located downtown. Needless to say, this system was not very effective in extinguishing and preventing the growth of fires. In 1863, the idea of implementing fireboxes was introduced by David Scannell, and in 1864, San Francisco installed its first set of boxes. The city spent $24,000 to furnish the entire city with boxes . However, it wasn’t until 1865 that the boxes were actually put to use. The city installed two separate kinds of alarms. Crank boxes were the most common box used. 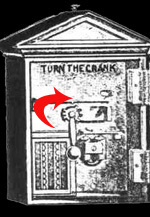 Upon the discovery of a fire near your signal box, turn the crank slowly and steadily about 25 or 30 times, then wait a few moments, and, if you hear no ticking in the box, or alarm on the bells, turn as before. If you still near no alarm, go to the next box and given the alarm from that. Never open the box or touch the crank, except in case of fire. Never signal for a fire seen at a distance. Be sure your box is locked before leaving it.